Kids love the opportunity to take photos. It’s a fun way for them to express their creativity and digital photography has made it easy and affordable. No longer do you have to develop endless photos of the same thing and there are many digital cameras on the market that take wonderful quality point-and-shoot photos. * Choose a small, easy to hold camera that’s not too expensive to start with. * Buy or make an album just for their photos, or give them scrapbook supplies to scrap with. * Make a pinhole camera. * Film vs. digital - digital doesn’t require developing to see the result of the picture, being able to see the picture is a great learning tool when you’re trying for a certain result. * Don’t scoff too much when they are taking your picture a lot; you are an interesting and familiar subject for them. 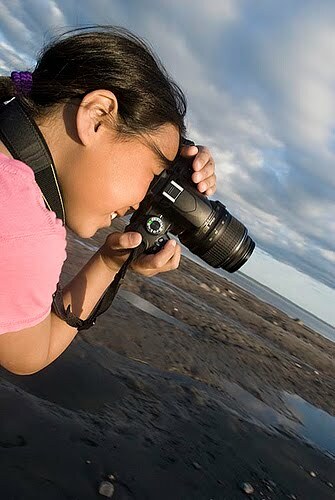 * Give them suggestions of what to snap, but don’t insist on subject matter- let them take pictures naturally. * Let them take the camera on trips to the park, grandma’s, or even the store. Inspiration is everywhere. * Talk about the photos- why did they choose the photo subject? What do they like about the photos? Were they trying to achieve a certain effect? Would they like to see it in black and white? Talk about anything regarding the photo at all, even if it’s just about what time it was when the photo was taken. * Share your pictures from the same event. For example, if you go to the zoo and you and your child take pictures, go home and compare who took pictures of what and where during the zoo visit.